I spend most of my time drawing imaginary people fighting imaginary oppression, but tonight I really felt I should draw something to honor the real heroes out there this week on the streets of Cairo, enduring truncheons, rubber bullets and firehoses in the hopes of a freer Egypt. Of course none of them will ever see my stupid drawing, even if Mubarak hadn’t shut down the internet, but I guess it’s my way adding my voice to the throng. I kinda like the black and white version, though I wish I could think of cleverer ways to create gray. The b&w original is for sale on etsy. GOOD LUCK EGYPT! And remember, the real fight will begin the morning after Mubarak steps down. 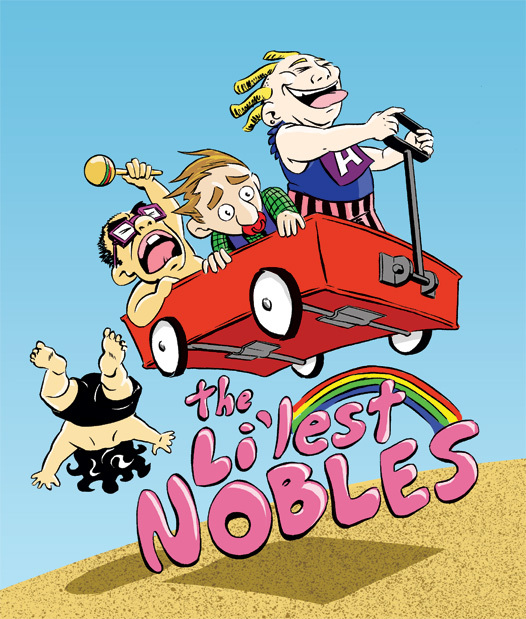 “The Li’lest Nobles,” a heartwarming children’s adventure about the Savage Nobles as BABIES. When their wagon becomes mired in the sandbox, their only hope of getting home in time for dinner is THE POWER OF IMAGINATION! But shouldn’t Theo be like a teenager already? Okay, seriously, this was a lot of fun to draw (especially since I pencilled most of it while on the clock at my barista job). I’m totally indebted to Aaron McConnell for the idea. Aaron drew a hilarious image of Marvel’s team of reformed supervillains, the Thunderbolts, as teeny tiny adowable widdle kids. 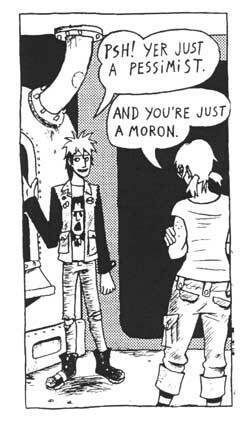 Aaron has had the disastrous good luck of becoming well known for drawing in the very narrow genre of Non-Fiction American History Comics. That’s because he does it very well, but he’s SUPER-diverse and I hate to see him straightjacketed into what can be a pretty staid style (as I guess comics about Civil War massacres, the founding of banks, etc. should be) when he is capable of such wonderful lunacy as well. I know that saying “King has really meant something to me” is a bit like saying you like the music of the Beatles or that you enjoyed the first Matrix movie, but I can only assert that in my case it’s really, actually true. But sometimes MLK Day bums me out; I feel the popular image of King the civil rights pioneer – the guy who led the Montgomery bus boycott, the guy who gave the “I Have a Dream” speech – often obscures the legacy of King the theologian, the political philosopher. I think he is at least as important as a thinker as he was as a public speaker, which is why I drew him with his mouth closed. Any remembrance of the civil rights activities of the 60’s can easily turn into a self-congratulatory massage circle, where the implicit message is “thank goodness we’ve got it right nowadays.” Even the more modest pundits who add that “there is still so much work to do” often seem to buy into the general end-of-history onanism. I’m afraid that this spectacle has become more obscene since Obama’s election, and the MLK Day ceremonies he’s presided over have filled me with a disgust that borders on despair. (By the way, I blame the ceremony organizers, not the President, who I’m pretty sure just shows up.) While Obama’s election was definitely a symbolic triumph of huge proportions, and I can’t begin to imagine what it meant to people who were alive in the 60’s, especially blacks, I always try to remember King’s own aversion to specific examples of individually successful black people. In his writings and speeches, he didn’t count the existence of a narrow black middle class as a victory, and if he did cite the accomplishments of individuals like James Meredith or Marian Anderson, it always accompanied a parallel citation of the nameless masses. I think anyone with eyes can see there are still serious racial inequalities in the U.S. today, and I even think most of the above-mentioned memorializers know this very well, even if they continue to play an ideological game. Moreover, I think, with King, that a fundamental class division underlies most racial divides, and that racial strife, if not exactly a subset of class strife, is certainly inseparable from it. It’s a big taboo to suggest (especially if you’re a white guy like me!) that King’s ideas extend beyond issues of racial injustice, but I think this is exactly what needs to be said if his legacy is to be rescued from those who are turning him into a historical relic of a social fait accompli. A stone monument, for goodness’ sake! I used to refer to this socialist-minded King as the “post-63 King.” My happy discovery of 2010 was just how inept this description was. For instance, in this mushy 1952 letter to his then-girlfriend Coretta Scott, (90% of which ends up being about the book she lent him, Edward Bellamy’s Looking Backward, which I have also read) King claims that “capitalism has outlived its usefulness.” In 1952! It was so refreshing to see that the socialist attitudes that characterize King in the final years of his life had been there all along. As contradictory as they now seem, I do think Marxist ideas must somehow be incorporated into Christian theology, perhaps in a similar way to how Aristotelian thought was adapted in the later middle ages (a proposal that at the time would have seemed equally untenable!) If this mammoth intellectual project of synthesis ever happens, I think King will be remembered as one who laid the groundwork. Oh, and one last thing! Let’s please, please, PLEASE start just calling him “King” instead of saying “the Rev. Dr. Martin Luther King, Jr.” or something like that every single time. We don’t feel the need to say “Mohandas Karamchand Gandhi” every time, do we?! Maybe at one time it was a big deal to point out that a black person had a PhD, fine. But when a somebody has attained the level of world-historical individual, we generally recognize this by dropping all but their last name. Heck, if the words “Derridean,” “Clintonite” and “Reaganomics” have entered the common parlance since ’68, isn’t it about time we promoted the poor old doctor to a monosyllable? That’s right, the ghosts are Klansmen! How’s that for dark? I pencilled these pages in a burst of New-Yearsy determination two weekends ago during a visit from Vancouver cartoonists Wei Li and Vanessa Kelly, two people who don’t mind if you look down while you talk to them (my kinda people!). I let the comic languish uninked until today, when I was home from work with a seriously nasty cold. 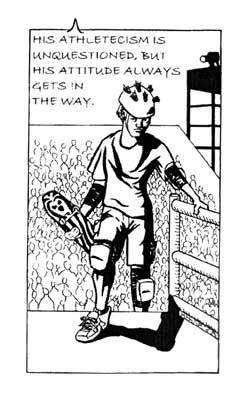 I’ll be submitting “The Misadventures of Herschel Pachman” to the video-game-themed February issue of Stumptown Underground. I have a few friends and acquaintances who draw lots of video game characters or vg-related art, and I’m pretty much in awe of what they do. Drawing only these four pages has convinced me that I probably do not have what it takes to do justice to the intricate designs of these types of characters. I really phoned it in on Sonic the Hedgehog, and only got away with the guy from “Dig Dug” (in the breadline behind Zelda’s Link) because that character is so pixellated already that nobody seems to know or care what he actually looks like – I certainly don’t. But otherwise, I’m actually quite pleased with how this comic turned out!